The average consumer is bombarded by super slick video ads every single day. We’re rarely impressed by them anymore and because we also have the attention spans of gnats, we look elsewhere. What do you do when a TV commercial comes on? You reach for your phone. You turn your attention away from a beautifully shot, highly produced, crazy-expensive ad …. in order to absorb whatever video some dude you follow on Instagram just posted. You don’t care that his video was not as well-lit and vivid as the commercial. (Although it could’ve been because his iPhone can shoot in 4K.) It doesn’t matter, because you’re watching it on a 3-inch widescreen. That dude’s video has your attention. It’s a real video so it’s more interesting. Relatedly, the last 3 items of clothing I’ve purchased have come straight from the vlogs I follow. These vlogs (video blogs, if you’ve been living under a rock with no wifi connection) are shot by regular women with either a consumer-grade DSLR, GoPro or an iPhone. They’re basically amateur videos of themselves living life in cute outfits and recommending their favorite items. Riveting stuff, I know. When I see one of them traipsing around San Francisco in new boots, I click the link below to see the price and BAM — I’m a click away from checking out. I wouldn’t have found myself there had I seen a model wearing those boots in a commercial. There are many things at play here (the rise of social influencers, product placement in content marketing, etc) but the one I want to focus on is the real impact of user-generated video: authenticity. That vlogger may have a partnership going with that boot company, but her vlog still feels a hell of a lot more authentic (and therefore trustworthy) than a hundred thousand dollar boot commercial. This is how is how video is being consumed now. This change is recent and it’s affecting the way marketers are able to reach audiences. It’s the rise of user-generated video. There’s a reason why people watch disjointed SnapChat stories. It’s the same reason why YouTube Stars are now more popular than mainstream celebrities, according to American teenagers. And why the videos that go viral aren’t usually the ones produced by a creative agency. User-generated video might be a little wobbly but it’s a stark contrast to and stands out against the rest of the super polished video ads we’re inundated with. It’s different. It feels more real. And it gets our attention. When it comes to social video, we’ve learned to value authenticity more than we actually value high production value. If your brand needs to boost it’s social media channels, don’t be intimidated by video. Don’t dismiss it because you can’t afford a traditional production company. Share user-generated video content. And ask your brand’s community (customers, employees, fans and followers) to contribute. The Auckland-based Marketing Managers at Disrupt, Fonterra’s accelerator program, wanted to show off one of their teams that were working in Sri Lanka. Rather than flying out a full film production crew, they asked the team to shoot and upload user generated videos with the EditMate App. What resulted was an authentic and candid behind the scenes video. We are now in a trust economy. Nielsen reports that 92% of consumers trust word-of-mouth recommendations above all other forms of advertising. 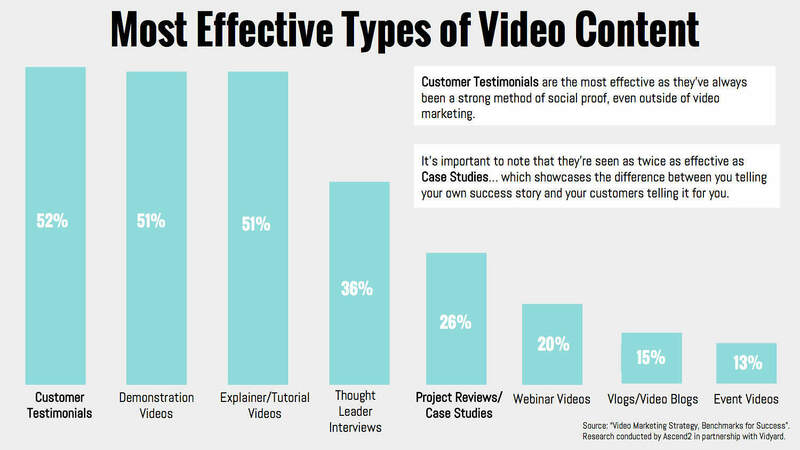 As seen in the graph below, despite the fact that they’re essentially sharing the same information — Customer Testimonials are twice as effective as Case Studies. To a consumer, there’s a difference between you telling your own success story and your customers telling it for you. Let your customers speak for themselves in the most transparent and authentic medium there is: video. Encourage them to shoot product reviews and testimonials. As a bonus, you can incentivise it with rewarding them with perks… but many will contribute just because they want to be part of the conversation. They want to see their feedback valued and shared. And for many (especially the younger generations), they’re probably going to be psyched just to see themselves featured. Social media is kind of like the jumbotron of the internet: as long as it’s from the right angle, everyone wants to be on it. Take for example the students at The International Travel College of New Zealand. We’ve created over 48 different videos from user generated footage their students upload to us, on their customized ITC by EditMate App. Their students are already of the generation that’s shooting and sharing video so they love seeing their footage featured in ITC’s marketing videos. Sharing user generated videos attracts new customers by providing social proof. 1 minute of video is worth 1.8 million words whether it’s shot on a RED ONE or an iPhone 6. And that video will be even more engaging if it’s footage captured by your own community. “Authentic” has become one of those annoying buzzwords that are constantly thrown around (like “disruptive” and “innovative”) but it hasn’t lost its meaning. Authenticity has an effect.